BY THE VACAVILLE REPORTER – Ivan Alan had always tried to eat healthy, but he admitted he doesn’t like the taste of soy, wheatgrass or tofu. Then he found out about Vitality Bowls, and tried one of their acai bowls at the Pleasanton mall. “It actually tasted good, it had flavor and it was healthy,” he said. Since getting involved with the company in 2016, he said he has lost 20 pounds and has more energy. There are still the stresses of owning multiple franchises — and building a new one in Vacaville — but Alan said he feels capable, and not weighed down. “Now I can really eat healthy and enjoy my food as well,” he said. Alan is planning for an Aug. 9 opening of the Vacaville cafe in the Nut Tree Plaza at the former Subway, 1631 East Monte Vista Ave., Suite 103. This will be his second Vitality Bowls cafe. He opened his first in Berkeley in September 2017. He is also the franchise owner of Edible Arrangements at the Nut Tree and his manager over there, Olga Dernova, will manage the new cafe. Edible Arrangements is a healthier gift choice than regular chocolates, he pointed out, and he wanted to expand. On the menu are a wide variety of these, including graviola, acerola, mangosteen, camu camu, spirulina, aronia, moringa, maca and bee pollen. There’s the Green Bowl with organic graviola, spirulina and hemp seeds, the Dragon Bowl with organic pitaya, coconut milk and bananas and the signature Vitality Bowl with organic açaí, strawberries and honey. A concentrate of the super foods are combined with apple juice, almond or coconut milk, Alan elaborated, and you can toss in other foods like kale, pineapple, blueberries or raspberries before that mixture is frozen and blended into a thick base. They top that with granola, almonds or fresh fruit, which gives it a nice balance because the bowl has crunch but also a smoothie texture, Alan said. Fresh juices, smoothies, soups, paninis and salads are also available, and there will be a coffee bar serving espresso and drinks packed with açaí, pitaya and matcha like the Açaí Latte and the Superfood Mocha. Organic cold brew nitrogen-poured coffee and organic kombucha will be on-tap. The cafe is focused on not only health-conscious eating, but on people who have dietary restrictions, including lactose intolerance, allergies and diabetes. Tara and Roy Gilad started the concept in 2011 in San Ramon after learning of their daughter’s severe food allergies, and wanting to find safe and healthy food alternatives. There are no-sugar, no-dairy and non-GMO options, and nearly the entire menu is organic, Alan said. In the kitchen, they make every effort to avoid cross-contamination so that an allergen does not come in contact with the order of a customer with an allergy. Alan, who lives in Walnut Creek, said he and his family have loved coming to the Nut Tree since he took over the local Edible Arrangements franchise in 2014. Berkeley may have its steady group of so-called “health nuts,” but Alan feels there are definitely people concerned with eating well in Vacaville, Dixon and Fairfield who will be drawn in. The owners of Vitality Bowls are equally enthusiastic. 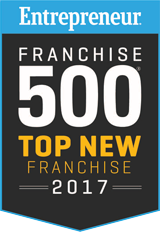 There are currently more than 52 Vitality Bowls restaurants across the United States with more than 100 franchise units under development. For more information, visit www.vitalitybowls.com. BY THE UNIVERSITY STAR – Vitality Bowls offers a variety of fast and healthy food choices, including one of the biggest food trends of today: acai bowls. Founded in 2011 in California, Vitality Bowls opened June 7 in San Marcos, one of the company’s newest locations. It branded itself as a superfood café; its menu items include superfoods such as graviola, acerola, goji berries and the ever-popular acai berry. The acai berry is a blackish-purple berry native to the Brazilian rainforests. It contains antioxidants, fiber and heart-healthy fats as well as other nutrients. It tends to be popular as a main ingredient in smoothie bowls. Roy and Tara Gilad, founders, initiated this superfood café notion due to their daughter’s severe food allergies. They wanted to get her the most powerful and healthy ingredients this planet has to offer in an allergy-free, no cross-contamination environment. According to the Vitality Bowls website, their strong commitment is to bring health and wellness to every community across the country by selling fresh, high-quality superfoods. Ashley Jaynes, franchise owner, is responsible for opening the San Marcos location. As a fitness and nutrition counselor, Jaynes said the company sells products she stands behind. She said foods the business offers are not common in the area and wanted to help change that. BY WPDH-FM – A new restaurant will be opening up where a beloved deli has stood abandoned for over a year and a half. Vitality Bowls is a chain of restaurants that is dedicated to serving healthy superfoods. The restaurant specializes in acaí bowls, which blends acaí berries with organic granola and other superfood ingredients. Other menu items focus on antioxidant-rich items like smoothies, fresh juices, soups, salads and even paninis. The restaurant brand was launched by a California couple who wanted to offer food that would be safe for their daughter who suffers from severe food allergies. As a result, all of the menu items at each location are made fresh in non-cross contamination kitchens to ensure that those with food allergies will feel safe eating at Vitality Bowls. Most restaurant locations are out on the West Coast, but the chain is looking to plant their flag on our side of the country. With one location in Long Island, this will only be the second Vitality Bowls restaurant in New York. Construction crews are hard at work on Route 9 in Wappingers Falls across from Kohl’s at the old Castaldo’s Deli. Last November the deli closed and has sat empty for over a year and a half. 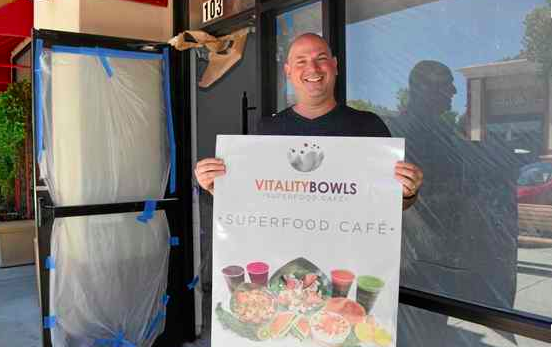 Now the location will soon reopen as the area’s first Vitality Bowls. You can check out their full menu and, once the restaurant opens, even order online at the Vitality Bowls website. BY SAN MARCOS COMMUNITY IMPACT – Vitality Bowls, a cafe and eatery specializing in acai bowls, opened at 210 N. Edward Gary St., Ste. 2012, San Marcos, inside The Local Downtown apartment complex, on June 7. The menu includes a variety of acai bowl options, and fresh juices, soups, paninis and salads will also be available. The cafe will include a full-service coffee bar. 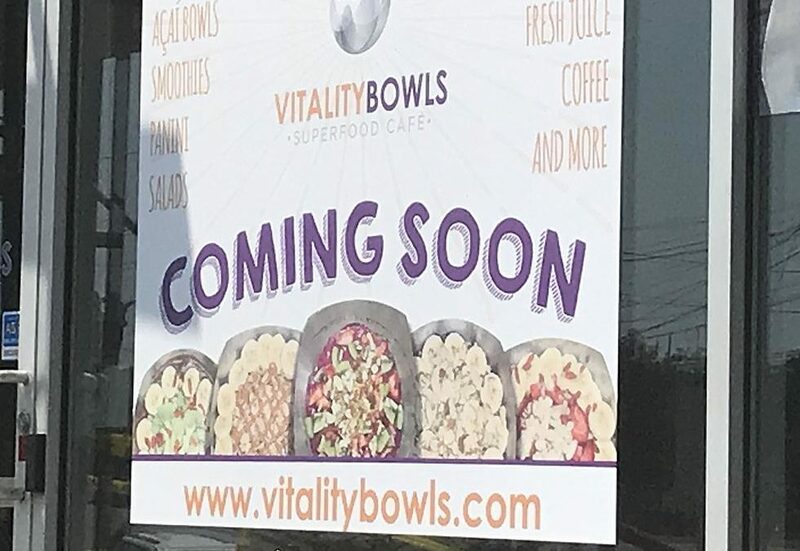 Vitality Bowls will be run by local franchise owner Ashley Wright, who also plans to open a location in San Antonio, according to a news release. The company is based out of Northern California and was founded in 2011. 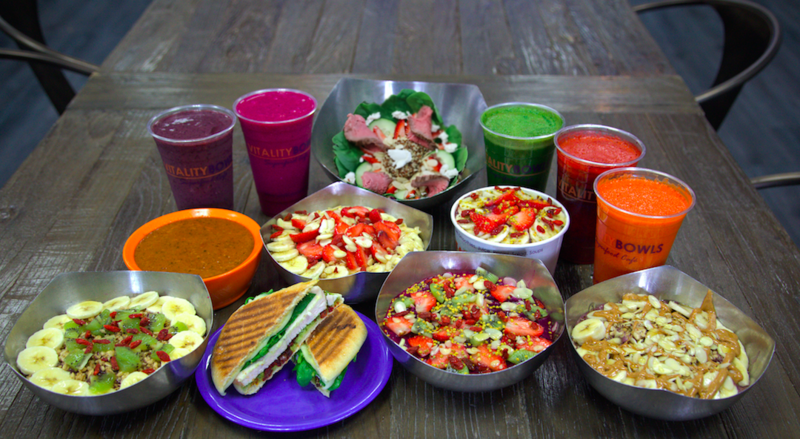 BY THE WEST ORANGE TIMES AND OBSERVER – If you’re craving a light lunch, a fresh smoothie or a nutrient-rich post-workout meal, Vitality Bowls in Dr. Phillips might be the place to go. Vitality Bowls opened its newest location May 17 at 8014 Conroy-Windermere Road, Suite 101. Harold and Jackie Gattereau are the owners of Vitality Bowls, and Jackie acts as an owner/operator. With a wide array of healthy options on the menu, Vitality Bowls boasts itself as a superfood café. The menu features a vibrant assortment of fresh smoothies and juices, as well as a variety of paninis, soups and salads for those craving a bite to eat. The menu also offers a wide selection of nutrient-packed superfood bowls. 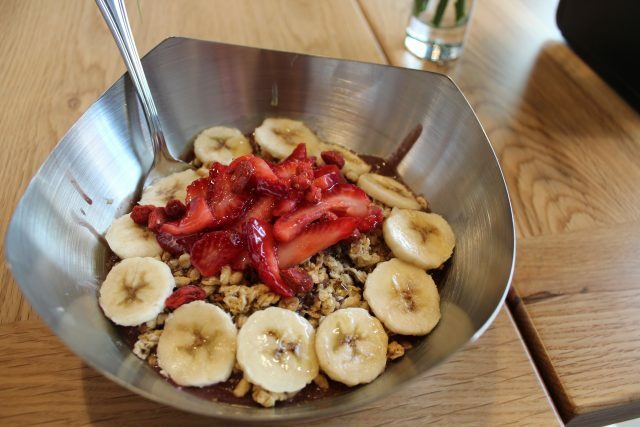 Many of the bowls feature organic açaí berries as a base ingredient. Superfruits pitaya, graviola and acerola also are used as base ingredients. The base ingredients are then blended with juices, fruits, and other ingredients. Customers then can choose from a variety of toppings such as organic granola, bananas, honey, strawberries, goji berries and chia seeds. Additionally, bowls are made fresh to order. Bowls and smoothies served at Vitality Bowls contain no ice, frozen yogurt, added sugar, artificial preservatives, trans fats or any other fillers. Tropical Bowl — Base blend of organic açaí berries, coconut milk, apple juice, bananas, mango, pineapple and flax seed. Topped with organic granola, bananas, strawberries, coconut shavings and honey. Dragon Bowl — Base blend of pitaya, mango juice, coconut milk, bananas, pineapple, raspberries and immune boost. Topped with strawberries, kiwi, almonds, goji berries, bee pollen and honey. Vitality Bowl — Base blend of organic açaí, “VB Blend,” bananas, Strawberries and flax seed. Topped with organic granola, honey, bananas, strawberries and goji berries. Roy and Tara Gilad founded Vitality Bowls in 2011 in San Ramon, California. The husband-and-wife duo started the cafe together after discovering their daughter had severe food allergies. Today, Vitality Bowls has 48 locations throughout the United States with more than 70 franchises under development. Although Dr. Phillips location is the only Vitality Bowls in Orange County, the Gattereaus plan to open another location in Ocoee next year.